Star Wars Table Cover - Set the scene for a truly unforgettable birthday party with our disposable Star Wars Table Cover. 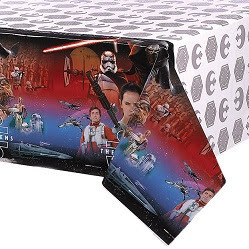 This plastic table cover will set the stage for the rest of your Star Wars party supplies to be featured. Covering a large rectangular space, this table cover fits on almost any table. Transform your living room into the galaxy with our entire collection of disposable Star Wars party supplies and tableware. Star Wars Plates - Serve up the Han burgers and all of your other Star Wars-themed foods on our disposable Star Wars Plates. Throwing an epic Star Wars birthday party has never been easier with our complete collection of Star Wars: The Force Awakens tableware. Pair these intergalactic paper plates with our smaller, themed dessert plates to be the master host of a legendary birthday party. 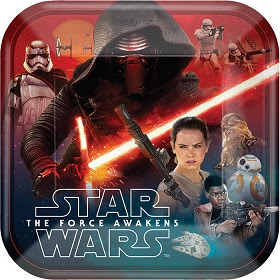 These disposable paper plates will surely bring the force to your celebration. 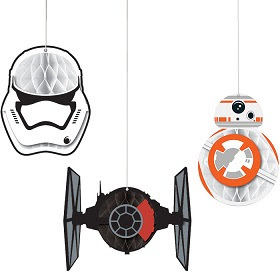 Star Wars Honeycomb Hanging Decorations - Light up the galaxy with our Star Wars Honeycomb Hanging Decorations. Hang these tissue decorations all around the birthday venue to bring your Star Wars party to life. These hanging decorations coordinate with other Star Wars decor like garland, banners, and confetti. Celebrate your little one’s birthday in intergalactic style with our Star Wars party decorations. Star Wars Confetti - A little party decorating can go a long way. Start by sprinkling a pinch of our Star Wars Confetti all over the party tables. After setting the scene with a little confetti, add additional party decorations like hanging cutouts, banners, and garland. With just a few simple kids’ birthday decorations, you can create a true Star Wars celebration. 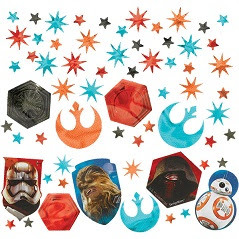 Throw an out-of-this-world Star Wars birthday party for your little force fan with our Star Wars Confetti.